Rachael Ray's show is one of the most popular cooking shows on TV and I've enjoyed her show since it has started on TV. It is a great show to watch, not just for people who love to cook, but a novice would feel comfortable watching this show. She is the Queen of the easy, great-looking but inexpensive meal on the food. And unlike other glamorous food TV babes who make it look easy but produce quite challenging recipes with hard-to-find or expensive ingredients, Rachael Ray's dishes are cheap, easy and good. She makes me want to cook because it looks so easy! I mean who wouldn't like to learn how to cook a meal in thirty minutes. As we know she really does have a wide range of products, her Rachel Ray cookware products are some of the most popular on the market probably due to her fame on TV which of course makes her a huge celebrity that has millions of loyal fans. Having the right cooking equipment is essential for people who love to cook! That's why TV chef and star Rachel Ray started her own cookware line! 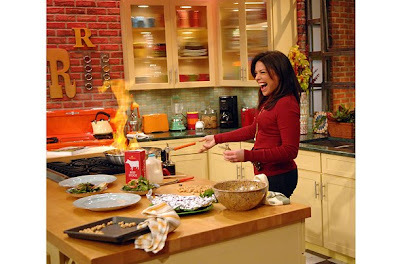 Her sunny, infectious personality has definitely contributed to her quality Rachael Ray cookware line. This cookware set is an exceptional value, including all of the pans needed to equip your kitchen with the most used cooking pieces. As the set contains only basic pieces, you'll really use each and every pan. 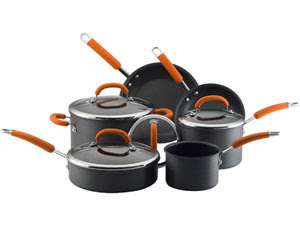 The handsome charcoal-gray, hard-anodized pots and pans feature shiny stainless-steel handles wrapped with neon-orange silicone grips that practically glow with the kinetic energy of this celebrity chef. It'll come as no surprise that orange is her favorite color. This is also an excellent gift as the set is covered by a lifetime limited warranty against defects! Tiger Chef, the leading online source for your kitchen needs currently offers more than 250,000 unique items for a great price! Their site also features commercial restaurant equipment including restaurant furniture, restaurant tables, bar equipment, smallwares, cooking equipment and their product list is truly endless. For a limited time, save up on Rachael Ray's favorites and give your kitchen a splash of color with exciting cookware from Tiger Chef! They will satisfy each of your cooking needs and that's a promise. Cooking is not something I do. LOL! The cookware does look good from Tiger Chef. Morning sweetie.. how are you today? feeling better?? Ohh i love cookware though I dont cook a lot.. just thinking that I have some on standby makes me smile. .lol! lol Ralph also can go crazy in the cookware section! =-O =-O =-O morning Elai! Hi Sansan :) glad you enjoyed the show too! oh no better go and see the doctor immediately!!! GP.. gone to doctor edi? What did they say? Owh I like to make easy, cheap, quick n delicious dishes. I dont think i am willing to spend more than an hour (mostly for 45minutes) per cooking on most days, hey i ve got blog to comment. LOL. Once in a while i dont mind making special dishes.